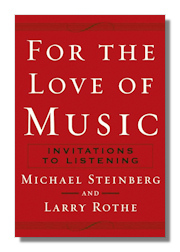 Michael Steinberg, among the pre-eminent music critics of our time, died on Sunday, 26 July 2009 at the age of 80. Despite the onset of cancer more than three years ago, he continued to live a full and vigorous life. He was revered by professional colleagues – the musicians, conductors, fellow writers, composers, educators, and orchestra executives with whom he collaborated over the course of a six-decade career – and loved by hundreds of thousands of audience members whose ideas and feelings about music were shaped by the unerringly lucid and insightful commentary he provided in program notes and pre-concert talks. A teacher of music history and criticism, a chamber music coach, a narrator, he was also the premier writer of program notes for audiences of orchestral, choral and chamber music, his works appearing not only in symphonic program books, but also on recordings, most notably those of John Adams' operas Nixon in China (1988) and The Death of Klinghoffer (1992). Steinberg was born on October 4, 1928 in Breslau in the last years of Weimar Germany and spent his adolescence in England, his mother having campaigned successfully to get him to safety via the Kindertransport, a rescue mission that saved nearly 10,000 children in the months leading up to World War II. By the end of the war, Michael, his mother, and a brother 15 years his elder, Franz, had emigrated to St.Louis, Missouri. Steinberg studied at Princeton with Strunk, Babbitt, and Cone, graduating in 1949 with a degree in musicology. On a Fulbright scholarship, he spent two years in Italy, where he met his first wife Jane Bonacker (they divorced in 1977). Upon his return from Italy to the U.S., he was drafted and spent two years in the Army stationed in Germany in the 1950s. He served as head of the music history department at the Manhattan School of Music (1954-55; 1957-64), and taught at Smith College, Hunter College, Brandeis University, and the New England Conservatory. During these years, he was appointed music critic at the Boston Globe; his tenure in that position is the stuff of legend among serious writers about music. 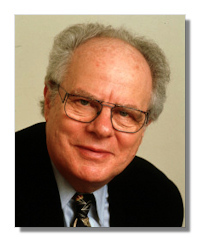 Steinberg's first staff position at a major orchestra was Director of Publications for the Boston Symphony (1976-79). In 1979 he joined the San Francisco Symphony as Publications Director and Artistic Adviser (1979-1989), which combined the tasks of writing program notes and designing the season's repertoire, in close consultation with then music directors Edo de Waart, followed by Herbert Blomstedt. In 1983 he married Jorja Fleezanis, the Associate Concertmaster of the San Francisco Symphony; when she was named Concertmaster of the Minnesota Orchestra in 1989, they moved to Minneapolis. He became program annotator to the New York Philharmonic in 1995, while continuing to serve as pre-concert lecturer in San Francisco, Minneapolis, Boston, Los Angeles, and New York. He took the post of Artistic Adviser with the Minnesota Orchestra, while maintaining the positions of program annotator for both the San Francisco Symphony and the New York Philharmonic. Even after announcing his formal retirement in 1999, Steinberg kept working. He wrote for the San Francisco Symphony. For the West Coast chamber music festival Music at Menlo, he introduced programs, coached ensembles, and led several evenings of their "Encounter Series." He also coached students at the International Festival-Institute at Round Top, Texas. Each summer, public poetry readings were highlights of both the Menlo and Round Top festivals, where Steinberg not only gave his own memorable readings but also selected poems and lovingly coached both students and faculty in their readings. He believed poetry to be a vital component of music-making, and that performing musicians could arrive at a better understanding of musical phrasing and impulses by reading poetry aloud. In Jorja Fleezanis' words, he believed that "rhythm, the gait, and the expression required to read poetry well are intimately linked to what is required to play music well." A frequent narrator, he gave the first performance of Aaron Jay Kernis' La Quattro Stagioni dalla Cucina Futerismo (The Four Seasons of Futurist Cuisine) in 1991, and was often heard as the narrator in Arnold Schoenberg's Gurrelieder, Survivor from Warsaw, and Ode to Napoleon, as well as Aaron Copland's A Lincoln Portrait. "Writers have many reasons to write, but all writers share one goal: to remind readers what it means to be human. Not every writer gets there. Michael did." Michael Steinberg is survived by his wife, Jorja Fleezanis; his sons Sebastian and Adam, both from his first marriage; his granddaughters Ayla and Rae; his grandson Julian; his first wife Jane Steinberg; his nephew Tom Steinberg; and his nephew Andy (and Val) Steinberg. Concerts to celebrate Michael Steinberg's life will be presented in San Francisco and Minneapolis at times to be announced. The family will be receiving friends at home in Minneapolis on Tuesday, 28 July 2009 from 4pm-8pm.